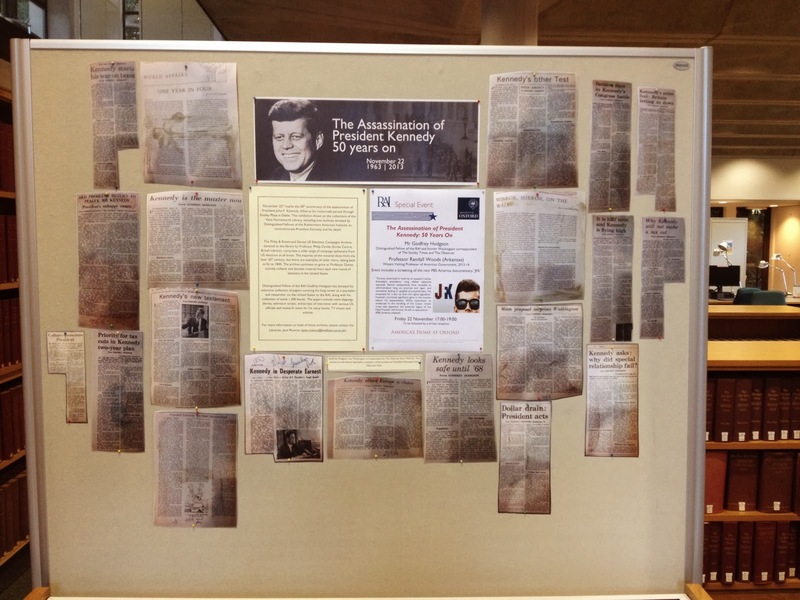 To mark the 50th anniversary of the assassination of President John F. Kennedy, we have set out an exhibition drawing on our collections, including materials donated by two Distinguished Fellows of the Rothermere American Institute, to commemorate his life and death. The exhibition may be seen in the three cases by the enquiry desk on the ground floor of the library. 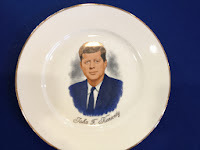 The first case contains materials relating to Kennedy from the Philip & Rosamund Davies US Elections Campaigns Archive – these include a 1958 ballot paper from Massachusetts, buttons and other ephemera from his campaign for President in 1960, and a copy of the official program for his Inauguration in January 1961. 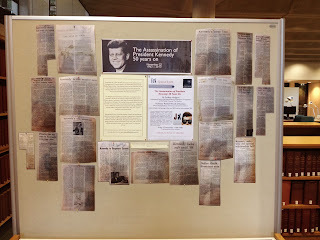 Accompanying these materials is a display of copies of clippings of news articles written by Godfrey Hodgson about President Kennnedy from his time as Washington Correspondent for The Observer which began in 1962. These news clippings have been donated to the RAI by Mr Hodgson as part of his collection of papers from his long career as a journalist and researcher on the United States. 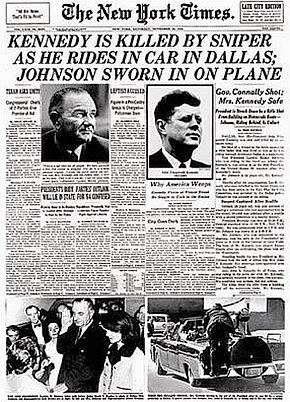 The second and third cases cover the events of November 22, 1963 and their aftermath, drawing on the library’s extensive holdings of official publications such as the Public Papers of the Presidents, Congressional Record, and the Report of the Warren Commission, as well as further articles from Godfrey Hodgson’s collection. The exhibition will remain on display in the library for the next few weeks. Bodleian Libraries will be running workshops on RefWorks and Web Archiving next week. Please find more details below. RefWorks for Sciences and Social Sciences (Wed 20 Nov 2.00 – 5.00) (wk 6) – RefWorks is an online tool which allows you to manage your citations/references, insert them into your word processed documents as footnotes or in text citations, automatically generate bibliographies and easily switch between citation styles. This introduction is open to all but the section on importing references will focus on Science/Social Science examples. WISER: Web Archiving – Time Travel on the Web (Fri 22 Nov 10.30 – 12.00) (wk 6) – A basic introduction to the world of web archives. This session introduces selected web archives and their potential uses. Who is this session for? Anyone new to the idea of archiving web sites, wishing to obtain an overview of current provision especially postgraduate students, researchers, academics and university staff. Presenter: Susan Thomas > Please book your place online. Bodleian Libraries will be running workshops and talks in the areas of research impact and reference management over the coming weeks. Please find more details below. WISER Research Impact I: Who’s citing you? (Tuesday 12 November 14.00-15.00) This workshop introduces citation tracking as a technique for finding out who is citing your work using Web of Science, Scopus and Google Scholar. The session will cover how to track citations using the three tools and the pros and cons of each. We will also include time for you to try out each tool to find citations to your own work. Who is this session for? : Researchers, Academics, Research Support Staff and Research Postgraduates. Venue: Radcliffe Science Library > Please book your place online. WISER Research Impact II – Tools of the Trade (Tuesday 12 November 15.15 – 16.15). Following hard on the heels of Research Impact I, this workshop will focus in on using Web of Science and Scopus to calculate h-indexes, find highly cited journals and to measure the impact of individual institutions and countries. In addition we will look at using Essential Science Indicators to find “hot” papers and authors and the use of altmetrics to measure downloads and mentions in social media. Who is this session for? : Please note that this session is for researchers, Academics, Research Support Staff and Research Postgraduates in the Sciences and Social Sciences. Prior knowledge: If you are unfamiliar with citation tracking please attend Research Impact I: Who’s citing you? first. WISER: Web Archiving – Time Travel on the Web (Fri 22 Nov 10.30 – 12.00) (wk 6) – A basic introduction to the world of web archives. This session describes how web archives came into being, and introduces selected web archives and their potential uses. WISER: Tech Tools – Reference Management (Fri 22 Nov 9.15 – 12.15) (wk 6) – Keeping track of your references and formatting them correctly for your thesis or publication is a chore. Reference management software makes it easy and is worth investigating. This introductory session gives an overview of how it works and the pros and cons of RefWorks, EndNote, Zotero and Mendeley. Presenters: Oliver Bridle, Pamela Stanworth, Kelly Schultz and Angela Carritt > Please book your place online. WISER: Mendeley for reference management (Wed 27 Nov 2.00 – 5.00) (wk 7) – Mendeley is a reference management package that helps you build libraries of references and then add citations and bibliographies to word processed documents. Presenters: Oliver Bridle and Owen Coxall > Please book your place online. Who is this session for? These workshops are open to graduate researchers > check dates and book your place online. Our reader PCs will all be replaced on Wednesday morning this week. We have requested that they be replaced in two batches so as to ensure that there are always some PCs available for readers to use, but there will inevitably be fewer available at any one time that morning. The PC at our enquiry desk is also due to be replaced that morning, so please bear with us while that happens!